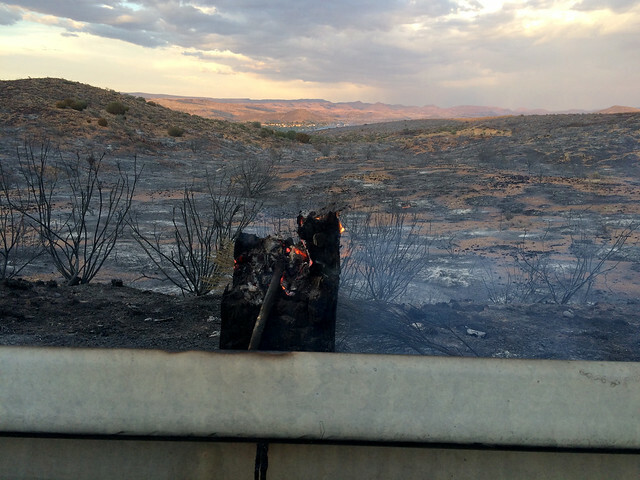 NOTE: With crews busy repairing a half mile of Interstate 17 guardrail that burned in a wildfire Tuesday near Cordes Junction, we're sharing an ADOT Blog post from 2013 explaining what guardrails do and why they're so important. First, check out images of this week's damage. Guardrails. You see them all the time, right? But, how often do you really think about the important job they’re performing? If your answer is “never,” that’s perfectly fine and, quite frankly, it’s what we expected, because who sits around contemplating guardrails? But guardrails really do perform a vital task, which is to separate vehicles from a non-traversable slope past the edge of the roadway or any type of fixed object (think power pole or building). They’re also the topic of this blog post, so hopefully your interest in guardrails is now sufficiently piqued! First off, there are different types of barrier out on the state’s roads, but what you see on many highways (and what we’re talking about here) is the w-beam guardrail that is secured to wooden posts. Fun fact: It’s called a w-beam because if turned on its side it looks like a W.
When the guardrail is hit by a vehicle, the posts move back and rotate with the force of the vehicle. The wooden posts, the w-beam, the dirt and the vehicle all absorb some of the impact, but the idea is that the w-beam will stay intact and prevent the vehicle from traveling off the side of the road into whatever obstacle the guardrail is there to protect you from. The energy of the impact is distributed to many of the posts, which are able to hold the w-beam against the vehicle, allowing the vehicle to come to a stop without crossing the barrier or flipping over it. Guardrails are only used when necessary. If a road can be built to avoid the need for guardrail, that’s typically the way to go. But it’s not always possible. We won’t get too technical, but engineers do have calculations for determining whether or not to use guardrail that take into account speed, traffic volume and the amount of clear area that there needs to be. If it is determined that guardrail is needed, engineers also have to figure out how much is necessary. The term “length of need” refers to the length of guardrail needed to shield the motorist from the potential hazard. Again, we’re not going to get technical here, but there’s a formula to calculate the length of need too. If a guardrail is hit, there’s some maintenance involved. According ADOT Maintenance Superintendent Craig Cornwell, his crews are out there repairing guardrail hits just about every day. He says the w-beam railing comes in sections (from 12.5 feet to 25 feet). “If a section is damaged, we replace that whole section,” said Cornwell, adding that the beams actually overlap and are connected to each other with eight bolts (there’s also a big bolt about 18 inches long that connects the beam to the wooden post. On top of repairs, Cornwell says his crews perform routine maintenance on the guardrails, which includes regular inspections.